Alienware repairs services cater to all our customers’ needs and enable us to deliver high-end, quick repairing services to Alienware owners in Perth and surroundings. Alienware laptops are heavy and sophisticated, but extremely beautiful and useful. 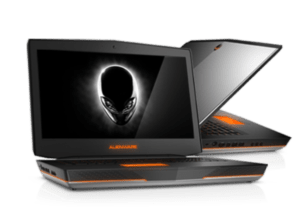 If you are an avid gamer or just the lucky owner of an Alienware laptop, you want to keep your laptop working at its max capacity at all times. You just can’t own an Alienware without leveraging its raw power and enjoying its stability and overclocking. However, just like any other laptop on the market, Alienware laptops tend to break. The circuits overheat, the battery may fail, the hard drive is slowed down or your favorite game is lagging really bad. When you notice one of these symptoms, it means it is time to look for Alienware repairs services in Perth. When it comes to Alienware repairs, you need to know that these laptops are extremely hard to repair. Their extremely complex design, toughness, and dedicated video cards make them very hard to disassemble and fix. More than often, finding the root problem might take several hours. Fortunately, at Gold PC we have the most qualified technicians to repair Alienware laptops. All our technicians have repaired several Alienware laptops before, and have discovered practical ways to tackle the problem. They use unique tips in order to find the root cause of the problem and then come up with the best solution at hand. The complex work is made easy by the experience and skill of our technicians. Buying an Alienware is a long-term investment. You should not let your investment amount to anything. Know that these laptops were built to last several years, so it is never too late to make your own Alienware notebook work flawlessly once more. Get your gaming laptop repaired by a team of professional technicians today. We are always more than happy to find the real cause of the malfunction and to make your laptop satisfy you once again. Even if we haven’t worked on your model before or the problem is more complex than anything we’ve dealt with, you can bet that we will be more than pleased to gain more experience in repairing Alienware laptops. and The Aurora R1 960, and We’re always ready to tackle more models and solve more complex situations. We offer a plethora of Alienware repair services. In addition to fixing your laptop, we can also fix the battery backup, jack, adapters, fans, inverter, keyword, LCD screen, and any other internal or external components. If you just bought your first Alienware machine and you are still trying to set it up, do not worry – you are not alone in this. Contact us and our specialized technicians will help you configure your Alienware laptop. From printer and scanner set up to external drives and hard disk configuration, we offer all the services you need in order to enjoy a perfect laptop. One of our top Alienware services is the laptop upgrade. If your laptop feels quite sluggish and it has no virtual issues, or it is just out of date, we can upgrade it with the latest components in order to make it run smoother than ever before. You can enjoy higher memory capacity, better CPU, faster hard drive, and of course a much-improved graphics card. Playing PC games released in 2019 will never be a problem anymore. Our experienced technicians will troubleshoot, verify, diagnose and repair your Alienware laptop, in one of our stores or on site. All the services we offer are done with high-end, Alienware parts. Thus, you can rest assured that your laptop will continue to work seamlessly for a long time to come. Enjoy top Alienware repairs from the comfort of your home. Simply contact us at 0415332231 or drop us a message and we will fix your laptop ASAP.